Recruited to be a lecturer on a group tour of Indonesia, Edward M. Bruner decided to make the tourists aware of tourism itself. He photographed tourists photographing Indonesians, asking the group how they felt having their pictures taken without their permission. After a dance performance, Bruner explained to the group that the exhibition was not traditional, but instead had been set up specifically for tourists. His efforts to induce reflexivity led to conflict with the tour company, which wanted the displays to be viewed as replicas of culture and to remain unexamined. Although Bruner was eventually fired, the experience became part of a sustained exploration of tourist performances, narratives, and practices. Synthesizing more than twenty years of research in cultural tourism, Culture on Tour analyzes a remarkable variety of tourist productions, ranging from safari excursions in Kenya and dance dramas in Bali to an Abraham Lincoln heritage site in Illinois. Bruner examines each site in all its particularity, taking account of global and local factors, as well as the multiple perspectives of the various actors—the tourists, the producers, the locals, and even the anthropologist himself. The collection will be essential to those in the field as well as to readers interested in globalization and travel. "The ethnographer’s gaze and that of the cultural tourist converge on the same object: the different and distant. 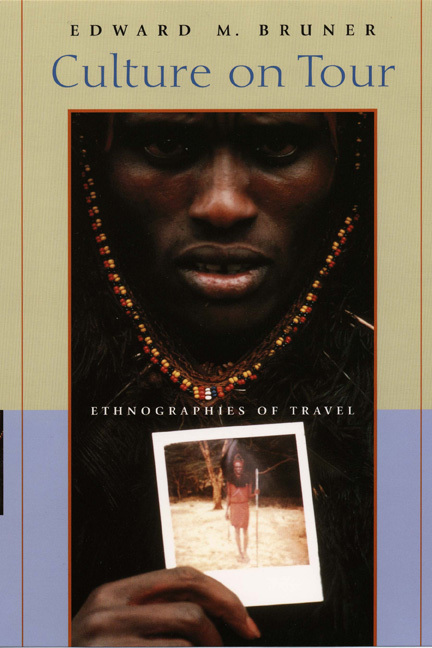 Edward Bruner, one of our most experienced and reflective ethnographers, looks at tourists looking at everything from staged Maasai dances and prime-time Balinese temple rites to roped-off Ghanaian slave quarters and Lincoln’s made-up hometown to see what they see and what it implies for anthropological theory and interpretation. An incisive, unsettling portrayal of the ways we watch now." "[Bruner’s] accounts of these investigations--including how his ’interventionist anthropology’ lost him a job as a tour guide--are absorbing, his anlysis lucid, nuanced, and free of mystifying jargon. The book is a pleasure to read." "Culture on Tour is as much a discussion of what is at stake generally for cultural anthropology, as it adapts itself to 21st-century social life, as it is a discussion of tourism per se by one of the most knowledgeable senior scholars. . . . Looking beyond the volume’s substantial contribution to the anthropology of tourism, I recommend Culture on Tour to anyone engaged in questions concerning the future of ethnographic practice generally. Especially for those who call into question the continued viability of the ethnographic method to contemporary topics of inquiry." "This eminently readable work will be of great value to scholars (at undergraduate and postgraduate levels) in the fields of anthropology, tourism studies, cultural studies, sociology, cultural geography, and to those with an interest in globalization, travel and performance. Culture on Tour is a testament to Bruner the ethnographer and Bruner the tourist/traveller, and certainly not least to Bruner the raconteur." "Not the least of Bruner’s achievements . . . is to show his readers how to think about our involvement in the immense processes of change at work in tourism. . . . For Bruner, tourism itself is a mode of learning, and in this beautifully composed, deeply thought-provoking book he teaches by example."